First known as the Ivins Syndicate Building, or just the Syndicate Building, the Park Row Building is located on Park Row in the Financial District of the New York City borough of Manhattan. It is also known simply as 15 Park Row. 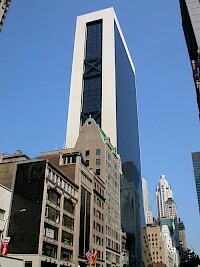 The architect was Robert Henderson Robertson, a pioneer in steel skyscraper design. 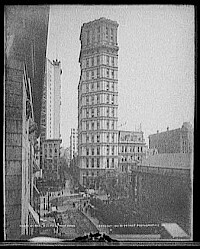 One of the first structures to be called a skyscraper, the building was completed in 1899 after three years of construction. 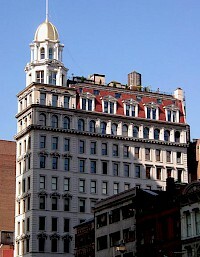 The Potter Building is an iron-framed office building located at 35-38 Park Row in Manhattan, NY. Commissioned by Orlando B. Potter and designed by Norris G. Starkweather, it was constructed from 1883 to 1886. 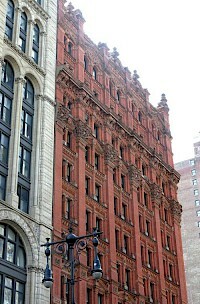 It replaced one of the New York World's former buildings which burned down in 1882 doing more than $400,000 in damage. The facade was constructed of brick and terracotta, which was chosen by Potter due to its fire resistance and low cost. The Random House Tower and Park Imperial is a 52-story mixed use tower in New York City that is used as the headquarters of Random House and a luxury apartment complex called Park Imperial. The book publisher entrance is on Broadway and goes up to 27 floors, while the apartment complex entrance is on 56th Street. Separate architects designed each of the sections. Skidmore Owings & Merrill designed the office portion, which has a steel frame. Ismael Leyva Architects and Adam D.
Rockefeller Center is a complex of 19 commercial buildings covering 22 acres (89,000 m) between 48th and 51st streets in New York City. Built by the Rockefeller family, it is located in the center of Midtown Manhattan, spanning the area between Fifth Avenue and Sixth Avenue. It was declared a National Historic Landmark in 1987. 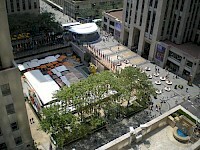 Rockefeller Center was named after John D. Rockefeller, Jr., who leased the space from Columbia University in 1928 and developed it from 1930. 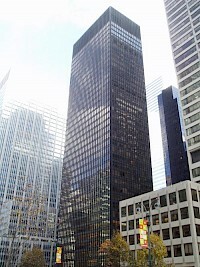 The Seagram Building is a skyscraper, located at 375 Park Avenue, between 52nd Street and 53rd Street in Midtown Manhattan, New York City. It was designed by Ludwig Mies van der Rohe, in collaboration with Philip Johnson. Severud Associates were the structural engineering consultants. 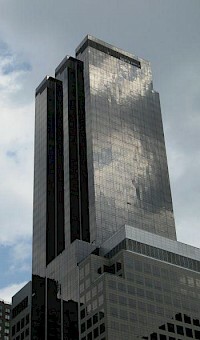 The building stands 516 feet tall with 38 stories, and was completed in 1958. It stands as one of the finest examples of the functionalist aesthetic and a masterpiece of corporate modernism. The Singer Building at Liberty Street and Broadway in Manhattan, New York, was an office building completed in 1908 as the headquarters of the Singer Manufacturing Company. 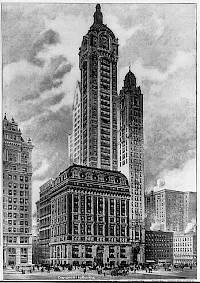 The building's architect, Ernest Flagg, was a supporter of height limitations and restrictive zoning, and showed his solution to tall-building crowding with the Singer's set-back design. The 12-story base of the building filled an entire blockfront, while the tower above was relatively narrow. The Sohmer Piano Building (or Sohmer Building) is an 1897 Beaux-Arts building located at 170 Fifth Avenue at 22nd Street, in the New York City borough of Manhattan, just southwest of the Flatiron Building. Designed by Robert Maynicke, it is easily recognizable by its gold dome. Sohmer & Co. The Solow Building, located at 9 West 57th Street, is a Manhattan skyscraper designed by Skidmore, Owings and Merrill's Gordon Bunshaft and built in 1974. It is located just west of Fifth Avenue, sandwiched between the 57th and 58th Street, next to such prominent buildings as the Bergdorf Goodman department store and the Plaza Hotel. Consisting of 50 stories and 689 ft. (210 m), the building's only competitor by height in the neighborhood is the GM Building, located one block north and east. The South Ferry Plaza, also called A Lighthouse At The Tip Of The Island, was a supertall skyscraper proposed to rise right next to the East River on Manhattan Island in New York City. The building would have sat on top of the South Ferry terminal and tower 1,084 ft (330 m) above street level, with 60 stories of office space. It was designed by architect Fox & Fowle Architects and Leslie E. Robertson Associates. The St. Paul Building was a skyscraper in New York City built in 1898 to designs by George B. Post that repeated the same Ionic order for each floor, to little cumulative effect. At 315 ft (96 m) tall it was one of the tallest skyscrapers of its era. The building was 26 stories tall. 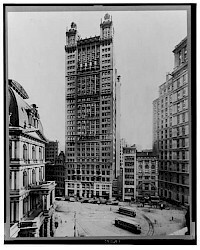 It was demolished without public expression of regret in 1958 in order to make way for the Western Electric Building. The building received its name from St.